The iPhone 5s falls under Apple's "S" branding, which means that, like the 3GS and 4s before it, it has the same build as the iPhone that came before it (in this case, the iPhone 5). But what the 5s lacks in design innovation, it makes up for in hardware, with a new 64-bit A7 processor, biometric fingerprint sensor, M7 motion coprocessor, and an improved iSight rear camera with dual warm/cold LED flash – all of which make it the most advanced iPhone ever. But are these enough to make it a must-have upgrade? 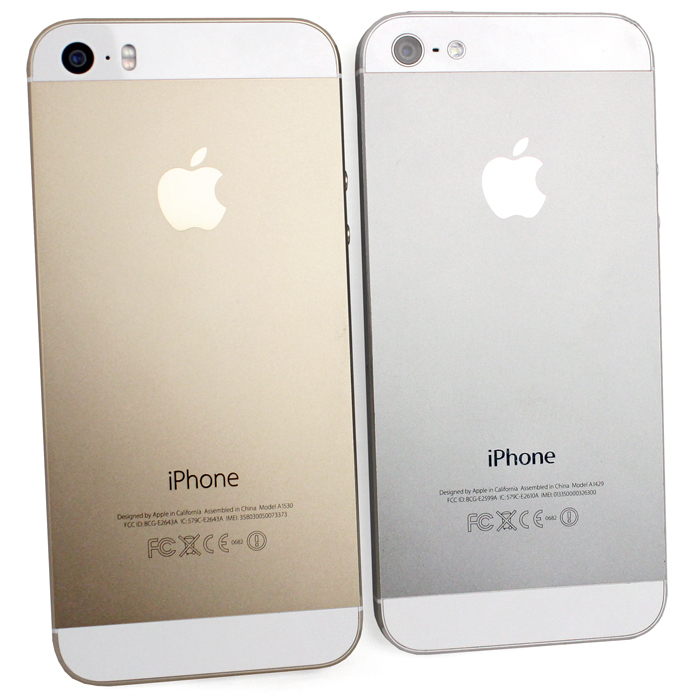 Like the 3GS and 4s, the 5s is in the unfortunate position of sharing the same design and build as its predecessor. Apple tried to change things up this year by introducing two new colors, Space Gray, a replacement for the old slate and black color with a lighter, gunmetal gray hue, and the brand new Gold, which is thankfully quite tasteful, and certainly not as blingtastic as it could be, with more of a classy, muted champagne bronze tone to it. While it doesn't really mesh with iOS 7's new bright and colorful design, if you want everyone to know you have the latest and greatest iPhone, this is definitely the color to go for. A few minor design changes have also taken place: The home button loses the familiar rounded square logo, and now has a metallic ring around it (which matches the main body color of the phone), and it serves as a biometric fingerprint sensor. On the back, the LED flash is a longer oblong shape, as it now comprises of two flash modules, one with a warm-colored LED and one with a cold-colored LED. The camera module itself also loses the metal ring circling the lens. 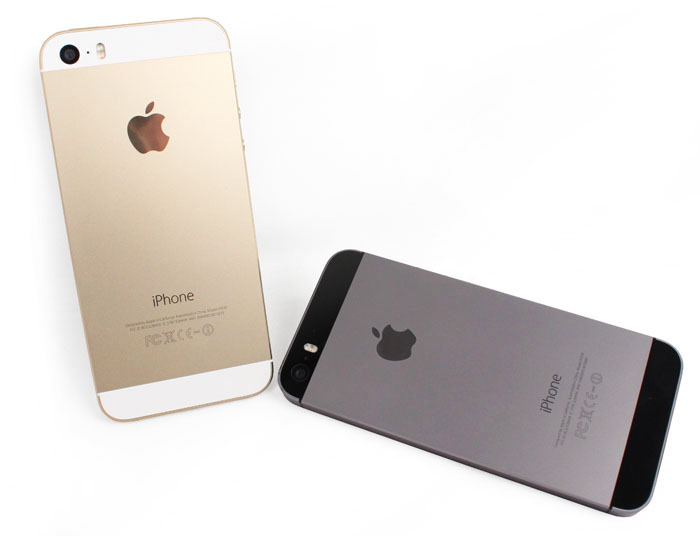 The "iPhone" wordmark font on the back of the 5s is also thinner than on the 5, better matching the new font of iOS 7. Other than that, everything remains the same as the 5 – button placement, chamfered edges, weight, and dimensions are all identical. Those wishing for a larger iPhone display will have to wait a bit longer as the 5s uses the same 4-inch, 1136 x 640-pixel resolution Retina Display as the 5. While the display may have been surpassed in terms of specs by some of the larger, Android flagship models with Full HD displays, it's still one of the best displays around, boasting excellent contrast, natural color reproduction, and fantastic viewing angles. It's plenty sharp too, thanks to the smallish display resulting in a 326ppi pixel density. Apple will definitely have to increase the screen size at some point, but for now, it's hard to find fault with the 5s' display. 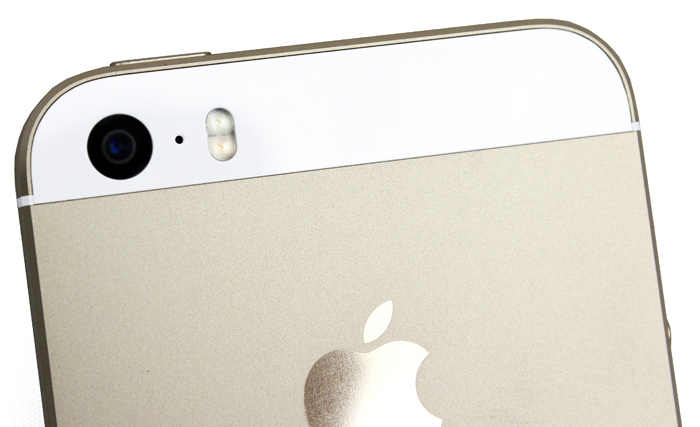 The iPhone 5s' most prominent new feature is its Touch ID biometric fingerprint sensor. The 5s isn't the first device to sport a fingerprint scanner – it's a common feature on enterprise notebooks, and the Motorola Atrix smartphone also included one. The problem with these scanners has always been their unreliability: They tend to be finicky, requiring you to swipe your finger in exactly the same way every time and, more often than not, with only minimal success. So has Apple done any better? The first thing you'll notice is that there's no swipe action involved with Apple's fingerprint scan. You simple place your finger (or thumb) over the home button. The metallic ring around the button acts as a trigger, detecting your finger and initiating the scan. The sensor works by taking a high-resolution scan of your fingerprint, which it then sends back to the A7 processor for analysis and comparison to saved prints. The setup process is simple: You press your finger against the home button for about five to ten times, and once the phone has enough information, it asks you to do it again at different angles, positions, and with the edges of your finger. After that's done, your prints will be added to the list of saved prints. The 5s can store up to five different fingerprint (or thumbprint) sets, so you can either set up your iPhone to recognize each of the digits on one of your hands, or you can let your loved ones save their prints to give them access to your phone. You can rename each fingerprint saved, so you know exactly which one to delete if you want to stop its access to your phone. Finally, you'll also have to set up a 4-digit numerical password, just in case the fingerprint scanner doesn't work, or you're wearing gloves, ensuring you're still able to access your phone. Once your fingerprint password has been set, all you need to do to unlock the phone is to press the Home button (only necessary if the phone is asleep) and keep your finger on the button for a second or two. And lest we forget, Touch ID can also be used to authorize purchases from the App Store. Testing the scanner, we were genuinely impressed by how fast and accurate it is. It quickly recognized and unlocked the phone no matter what angle or how much pressure we pressed our fingers against it (you can put your finger upside down and it will still work!). And while it had some difficulty when our fingers were wet, a little bit of dirt or sweat is no problem at all. The process is incredibly convenient, with the phone unlocking with next to zero delay, making it much faster than Apple's traditional 4-digit passcode, and it easily beats Android's pattern unlock too. In fact, the first few times we did it, we had to check to make sure the password requirement was still on. Use it a few times and you'll wonder how you ever lived without it. At the moment, Apple hasn't released the API for the fingerprint sensor, and for security reasons, it may never do so, so it's not an option for third-party apps just yet. But hopefully Apple will reconsider as there's plenty of potential for how useful it could be. Mobile banking for one would hugely benefit from a reliable, convenient biometric scanner. 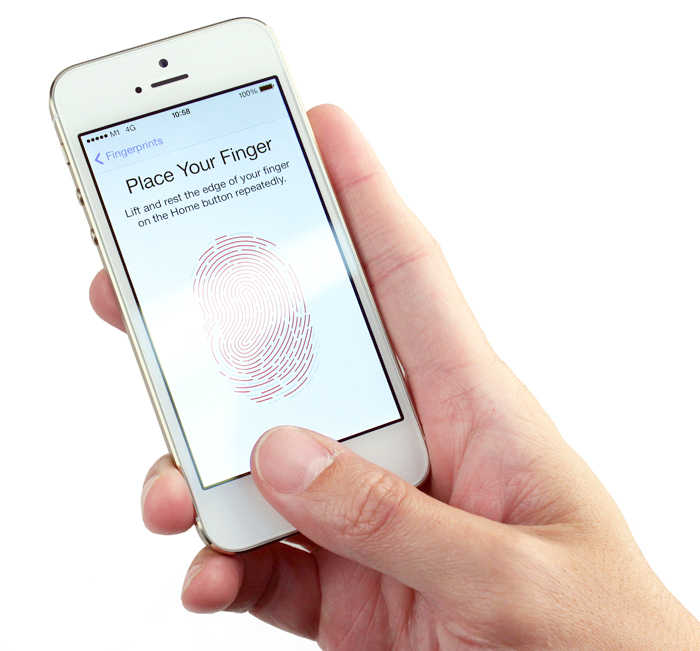 For anyone concerned about thieves accessing their phone with a photocopy of their fingerprint or – as gruesome as it is to suggest – some thug chopping your finger off, Apple has stated that the sensor actually scans just beneath external skin layers to see the living layer of skin directly under the surface. Not only does this result in a more reliable reading that ignores dirt and fluff on the surface, it means that photocopies and dead fingers won't work. For extra security, you'll also have to enter the numerical passcode if your device has been rebooted, or if you haven't unlocked it in more than 48 hours. 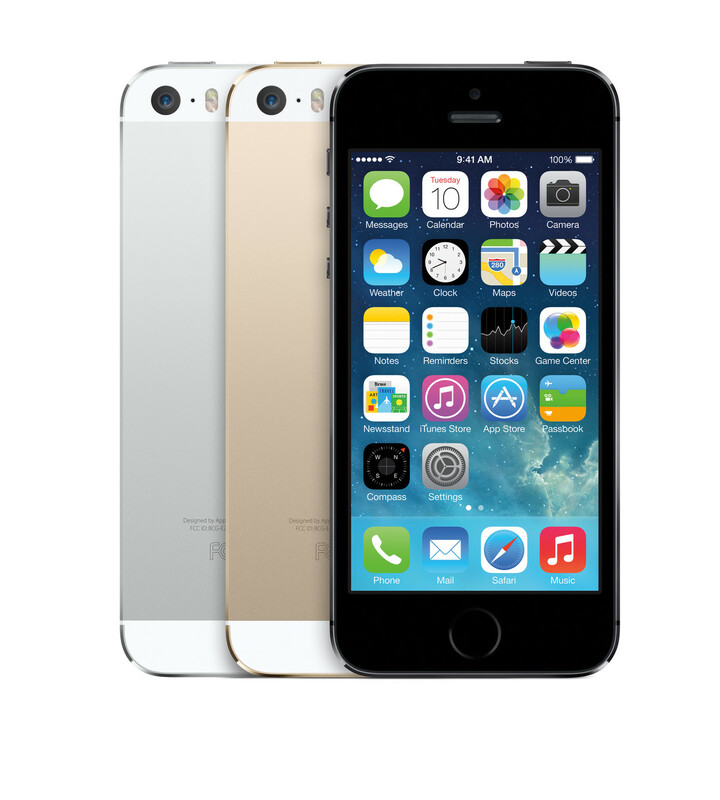 The 5s features a new M7 motion coprocessor that utilizes all of the information from the iPhone's other sensors, including the accelerometer, gyroscope and compass. We've yet to see the full potential of this processor but Apple has already started incorporating support for it into some of its apps. For example, in Apple Maps, you can plan a route to a location by car, but maybe when you get there you end up having to park a distance away. When you get out of your car and start walking, the phone will detect that and change its directions to a walking route for you automatically. It doesn't just detect that you've slowed down either - the M7 processor has 'contextual awareness' that can detect walking, so it knows you're not just sitting in slow moving traffic. Unlike the fingerprint scanner, Apple has released the API for the M7 coprocessor. 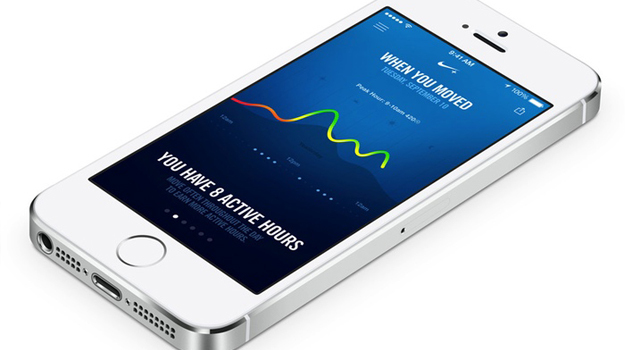 The Nike+ Move app will be one of the first apps to utilize it when it is released later this year. The app will effectively turn your iPhone into a Nike FuelBand, calculating your activity during the day and motivating you to do more with NikeFuel. You'll also be able to monitor and challenge your friends through the app and Apple's Game Center. For a full breakdown of iOS 7, check out everything you need to know in our hands-on feature, as well as tips for the new iOS, and 11 details you may have missed in iOS 7. In brief, the new OS delivers a more colorful look and feel, with a thinner, more modern font, and a flatter overall design. Gone are the faux leather, felt, and paper textures, replaced instead with cleaner, starker designs. 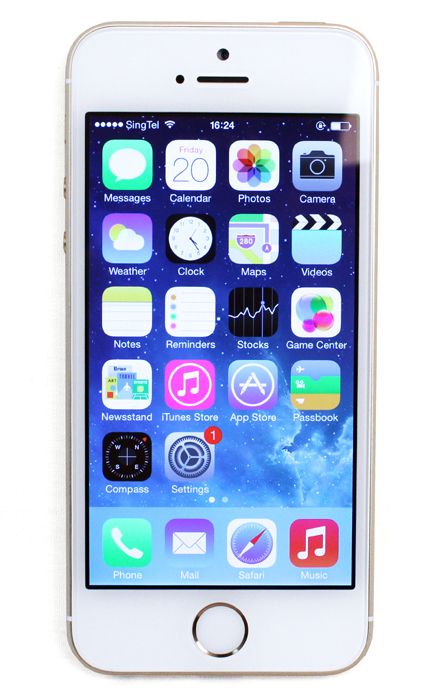 iOS 7 has been optimized for use with the iPhone 5s' 64-bit processor and it shows, by delivering a super-smooth, lag-free user experience. 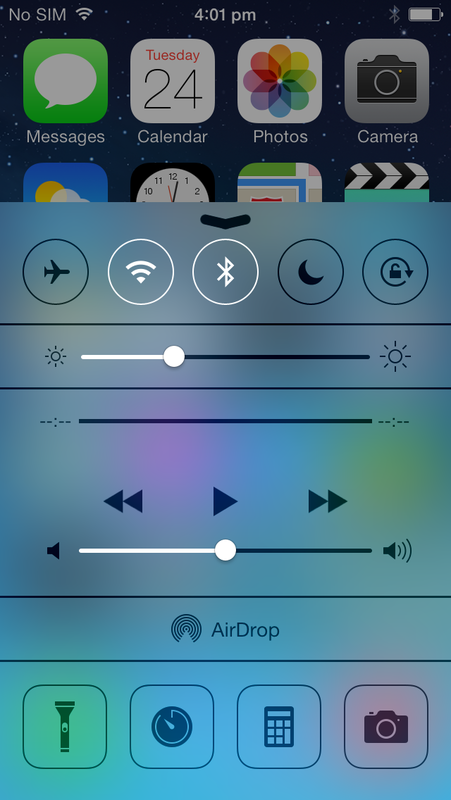 Other than the new look and feel, the one major addition to iOS 7 is the Control Center panel, which can be accessed by swiping up from the bottom of the screen. Android users have had the similar Quick Panel for a long time, and it's about time iOS got it too. The Control Center gives you quick access to a multitude of settings, with toggle options for screen orientation lock, volume, Bluetooth, Airplane mode, and more.